1Bandung Institute of Technology (ITB), Jl. Ganesha No. 10, Bandung 40132, Indonesia. 2Graduate School of Engineering, Kyoto University, Katsura C1-2-215, Kyoto 615-8540, Japan. Spatial mapping of geothermal-resource potential with an accurate detection of steam spot using remotely-sensed technology requires quantification of physical parameters of surface manifestation related to geothermal system. Synthetic Aperture Radar (SAR) remote sensing, the only useful observation and monitoring technology that can be undertaken in any weather condition, measures backscattering powers returned to a satellite sensor. The backscattering is mainly controlled by the surface roughness that is related to rock types. Resistance to the geological processes such as weathering, erosion, and alteration is different with rock type, which causes a dependence of the surface roughness upon rock type. The backscattering is also affected by dielectric permittivity and magnetic permeability of the ground surface. The purpose of this study is to develop methods for quantifying the surface roughness from the SAR data and detecting surface manifestations of geothermal based on the roughness. A surface roughness dataset by ground-truthing in a geothermal field using a profiler of 30 cm length was used to verify the estimated roughness. Detrending and interleaving techniques of the surface profile were applied to quantify accurately the surface roughness. Correlations of the measured surface roughness with the polarized backscattering intensity and the incidence angle were investigated, which was finally used to make a physical model by a curve fitting of 269 data points. The resultant model was applied to map a spatial distribution of the surface roughness over a 72 km2 area in the Wayang Windu geothermal field, West Java, Indonesia using two scenes of Full Polarimetric mode of the Phased Array L-band Synthetic Aperture Radar (PALSAR) onboard Advanced Land Observing Satellite (ALOS). Both the ground-truthing and the SAR roughness data indicated that the roughness increased and decreased gradually towards the altered surface manifestations. The rock types and thermal intensities of hydrothermal fluid controlled the surface roughness in general. For lava and pyroclastic rocks, hydrothermal fluids have altered the rock matrices into clay minerals that are easily eroded. The rock fragments are more resistant than rock matrices at ground surfaces. Consequently, surface of the altered rocks becomes rough than the intact rocks in general. For tuff and lahar deposits, hydrothermal fluids have altered all the rock compositions into clay minerals and produced flat surfaces. Characterizing physical properties of ground surface using Synthetic Aperture Radar (SAR) are crucial for geological target detection under Torrid Zone condition (Saepuloh et al., 2010). The backscattering intensity of SAR chiefly is a function of two physical quantities of surface material, surface roughness and dielectric parameter. The two parameters were proved effective to discriminate ground surface materials at volcanic field such as pyroclastic flows, lava, and lahars (Saepuloh et al., 2010). In this paper, we focused on the surface roughness parameter at geothermal field because this parameter controls the backscattering signals significantly (e.g. Duarte et al., 2008; Saepuloh et al., 2012; Saepuloh et al., 2015). The surface roughness discussed in this paper means the variance of Earth surface elevations above the horizontal line. 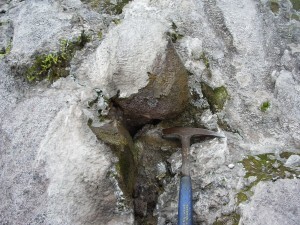 The interaction between hydrothermal fluid and host rocks is aimed to be analyzed by the surface roughness parameter. The resistance of the rocks presented by their roughness to the geological processes such as alteration due to geothermal process depends on rock type and/or thermal intensity. Planetary surface roughness extraction and modelling using remotely sensed techniques is one of challenging topics for the last decades. The surface roughness is one parameter that geological features could be predicted such as topographic feature associated with lava flows (Campbell, 1996) and soil (Duarte, 2008). Typical quantifying techniques are template devices, stereo-photography, simple surveying, laser altimetry, and radar interferometric (Campbell and Garvin, 1993). However, quantitative interpretation of data collected in fields is still a difficult problem. The main problem in analyzing such data is how to quantify the surface roughness for comparison with radar observation and prediction of backscatter behavior in various polarization modes. To overcome this problem, we measured surface roughness at a field along three directions: azimuth, range, and dominant topographic undulation. The azimuth and range directions follow the satellite movement and line of sight, respectively. The dominant topographic undulation is a general pattern of topography within 30 m radius. A fixed pin meter with correlation length 30 cm, similar to the L-band frequency, was used for the measurement. The polarimetric mode of the Phased Array Synthetic Aperture Radar (PALSAR) onboard Advanced Land Observing Satellite (ALOS) were used in this study. In order to obtain the most representative ground surface model, a combination of the backscattering intensity data for each polarization mode and directional surface roughness at field was analyzed. The linear curve fitting method was applied to approximate the measured surface roughness at field using Polarimetric SAR data. The surface roughness was measured at 269 points at field along above the three directions. The surface roughness was identified for three geothermal manifestation zones, altered surfaces, mud pools, and hot springs in the selected study area of Mt. Wayang Windu, situated in the southern part from Bandung City, West Java, Indonesia (Fig. 1). Figure 1: Study area located at Mt. Wayang Windu in West Java, Indonesia with sites of explored geothermal prospects in gray arc segments (Hochstein and Sudarman, 2008). Inset showing local topographic of study area presented by SRTM 30 m DEM (Farr et al., 2007). Mt. Wayang Windu in a part of volcanic arc was formed in response to the subduction of the AustralianIndian Plate beneath the Eurasian Plate. This subduction has been active since Cretaceous (Whittaker et al., 2007). where η and ξ denote the scattered and incident polarization modes, respectively, in either the horizontal (H) or vertical (V) direction; k is the wave number; h0 is the height of a random surface above the mean plane or surface roughness; θi is the angle of incidence from the mean normal direction to the surface; ω is the roughness height spectral density of the surface; and α is electrical parameter of the surface. Since the h0 should be constant at surface, we tried to accommodate the roughness model by four polarized modes: HH, HV, VH, and VV. The HH and VV termed as co-polarization and HV and VH as cross-polarization are analyzed based on field roughness measurements. For field surface roughness, we measured the surface roughness using a set of pin meters at the geothermal manifestations. There are nine zones identified as geothermal manifestation including hot springs, fumaroles, mud pools, and alteration zones. The gridded measurements about 30 m lag were performed at the nine zones to obtain detail transition of hydrothermal activity to the surface roughness spatially. There is a large crater rim about 3.3 km in diameter with two highest summits at the northern and southern rims termed as Puncak Besar and Malabar. Southern part from the rim separates the other summits, termed Gambung, Bedil, Wayang, Windu, and Ramiru. Generally, the summits are distributed from north to south and Wayang Windu is located in the middle summit lines. The measured points are distributed around the summit lines. There are three measured crater zones containing surface manifestation to be discussed in the following section. The three measured zones are located between Puncak Besar and Gambung with mud pools manifestations, Bedil and Wayang by altered surfaces manifestation. Their locations are simply termed Zone-1 and 2. The Zone-3 was selected at hot springs manifestations about 4 km from the craters. The surface roughness at the three Zones were identified and compared for the σ0 from co- and cross polarization modes. Variety techniques to measure surface roughness at filed have been discussed. Campbell and Garvin (1993) used laser profilers, Gaddis et al., (1993) used mechanical profiler, and Farr (1992) used stereo-photography to measure surface roughness. Their investigated profile lengths are also varying from centimeters to hundred meters. The longer profile length produced generalization effect when root-mean-square (RMS) roughness base quantification is used. A physical measures approach was adopted in this paper to quantify surface roughness using a fixed 30 cm pin meter. This approach produces a realistic quantitative characterization of natural terrain by taking an assumption that the surface is stationary (Shepard et al., 2001). Investigated profile length is 30 cm to obtain surface roughness in detail based on RMS roughness criterion. This length is also agreeable with sensitivity of L-band frequency to distinguish surface materials based on their roughness (Saepuloh et al., 2013). In order to know the backscatter response to the surface roughness in azimuth and range direction, we measured surface roughness at field along flight direction of the SAR sensor (azimuth), look direction (range), and dominant topographic undulations termed as N-S, E-W, and N to E. The dominant topographic undulation was also observed because at certain areas the roughness does not align to the azimuth and roughness. The field roughness measurements permit to establish three qualitative classes of geothermal surface manifestation: alteration zones, mud pools, and hot springs. In this paper, the discussion is focused on the surface roughness characteristics at the three classes: Zone-1, 2, and 3. Zone-1 located between Bedil and Windu is composed by altered surfaces, Zone-2 between Puncak Besar and Gambung is composed by mud pools, and Zone-3 is composed by hot springs. The selected zones are presenting general geothermal surface manifestation at Wayang Windu geothermal field. The ground surface of Zone-1 located at Wayang Crater is composed by vegetation, grasses, and fragmental rocks with size 5 30 cm. The rock surface generally has been altered to be soil with bright greyish to yellowish color. The vegetation is rare at alteration areas. Zone-2 located at Burung Crater is composed mainly by dense vegetation, grasses, and farms. The ground surface is composed chiefly by flat soils with mud pools at the crater area. Zone-3 located at Kertamanah is composed by grasses, farms, and ponds. The tea plantations are also existed at hilly terrain. The hot springs deliberate warm water about 55 C with pH 6.3 to the ponds. The ground surface is dominated by the almost flat soils and grasses. where n is number of pin bar (=60), z(xi) is height of the surface at point xi, is mean height of the surface within the profile, and is measurement direction either in N-S, E-W, or N to E.
Following roughness quantification standard by Shepard et al. (2001), we used detrending and interleaving process to the original data. The detrending process was applied using a best fit line subtraction of the original data to produce zero mean of the profile. This process is used to emphasize the small scale variation of terrain from general trend. The detrending process was also proved effective to reduce topographic effect from roughness component within the profile. Figure 2 shows the detrending performance to the original data at the selected measurement point WW-020. The detrended surface roughness presented in three directions: N-S, E-W, and N 115 E produced the terrain profile with zero mean. Each measurement direction produced topographic expression of surface roughness. Based on this plot, we obtained that the surface roughness is not only function of topographic expression, but also the measurement direction. Therefore, three dimensional measurements are necessary to quantify precise surface roughness parameter. The interleaving process was also applied to the RMS height H0 to obtain accurate correlation each pin height in a profile. The process is a technique which two pin points on a surface are chosen and compared. Thus, the process is effective to reduce dependencies of H0 to the profile length. Therefore, the quantified surface roughness is predicted representing the wide terrain not only a measured point. Assessing the geothermal manifestation, we tried to correlate the H0 explained in the previous to the acidity parameter at and around surface manifestations. The acidity parameter presented by pH lower than 7 is one parameter to identify geothermal surface manifestation (Libbey and Williams-Jones, 2016; Gherardi et al., 2002; Joseph et al., 2013). There were three zones identified based on geothermal manifestation types: Zone-1 at altered surfaces, Zone-2 at mud pools, and Zone-3 at hot springs areas. The correlation plot was depicted by Figure 3 for each zone with three directions of measurement: N-S, E-W, and N to E. According to the plot, there is a separation at pH 5 that the plots are concentrated at lower and higher than pH 5. The separation is originated from discrete surface manifestation zone. There is no gradational pH in spatial boundary of surface manifestation. It may infer that the surface manifestation is local and the thermal effect from geothermal fluids affect the ground surface locally. For Zone-1, pH higher than 5 correlated with low H0 and lower than 5 with high H0. A medium correlation determination about 0.5 was obtained by the mean of the three directions of measurement. According to the geological map of Alzwar et al. (1992), Zone-1 is composed by altered lava and pyroclastics from Malabar old volcanic products. Figure 2: Detrending process at one point at Zone-1 as shown by Figure 2 to remove the topographic effect in the surface roughness measurements. Figure 3: Scatterplot between RMS surface roughness and pH at different geothermal surface manifestation showing the characteristics of ground surface due to hydrothermal activities. Surface roughness measurements at field were performed in three directions N-S, E-W, and N to E to obtain complete parameter of surface roughness. The mean values among the three were used to calculate the correlation determination with pH. We interpreted that the geothermal fluids affected to the rock matrices of lava and pyroclastics is higher than rock fragments. Therefore, the altered rock matrices are easier to be eroded than rock fragments. The field observation confirmed that the ground surfaces are covered chiefly by rock fragments with size from gravel to boulder. Low pH caused strong alteration to the matrices of lava and pyroclastics which produced rough surfaces from rock fragments. On the contrary, high pH affects the rock surfaces relatively weak for same geological condition. For Zone-2, a higher correlation determination about 0.6 than altered surfaces at Zone-1 was obtained. According to the geological map of Alzwar et al. (1992), Zone-2 is composed by Malabar volcanic products containing tuff and laharic breccia. The low and high pH are located at low and high H0, respectively. Contrary to the altered surfaces, the smooth and rough surfaces agreed with low and high pH, respectively. The ground surface of Zone-2 located at Burung crater is covered by rare vegetation such as grasses, farms, and trees around the crater. The crater with diameter about 350 m is bordered by abrupt topographic at NE part and located in the valley with flat surfaces in general. Based on field condition, the weathering is more influence to the ground surfaces than alteration process. We interpreted that the weathering process changes the rock matrices and fragments to soil. Therefore, the ground surface is flat without fragmental material such as gravel and boulder. The correlation between pH and H0 at Zone-3 showed a discrepancy. The low correlation about 0.03 was obtained from the scatterplot. The ground surface of Zone-3 is covered by grasses, tea plantations, and farms. The hot springs are located at wet ground and ponds with undulated topography. The temperature and pH of the warm ponds are about 55 C and 6.3, respectively. The hot springs might affect the host rocks weakly. Therefore, surface roughness is independently to the spatial effect of the hot springs. According to the geological map of Alzwar et al. (1992), Zone-3 is composed by laharic deposits containing fine to coarse old volcanic products. The weak and limited hydrothermal activities to a large fragmented materials might cause low correlation between pH and the surface roughness. According to characteristics of the surface roughness at three geothermal manifestation zones, we identified that the altered surfaces and mud pools have correlation to the roughness of their ground surfaces. The rock types and thermal activities are supposed to be the significant to the surficial processes. Strong thermal activities will alter the matrices of hard volcanic products such as lava flow and pyroclastics into high erodibility material such as clays. Then, the erosional process removes the matrices and remains the fragments of the rocks. Therefore, the surface roughness will be high. However, when the high thermal activities interact with soft volcanic products such as tuff and lahar, the surface erodibility will be high which produces flat surfaces. It may infer that the low thermal activities will affect the volcanic products weakly. Therefore, the surface roughness is independent to the surface geothermal manifestation. Following this characterization and identification, we tried to generate a surface roughness model using polarimetric ALOS PALSAR and surface roughness measured at altered surfaces. Spatial surface roughness model should provide a possibility to detect altered surfaces widely as discussed in the next section. Backscattering of SAR data is known to be an effective means of assessing surface roughness and the dielectric property of surface material (e.g., Evans et al., 2012; Saepuloh et al., 2015). However, interaction between surface roughness and polarized backscattering signal is still unclear. We used two scenes data of ALOS PALSAR data as explained in. The ALOS PALSAR is utilized by capability to transmit and receipt signals in horizontal (H) and vertical (V) propagation. Therefore, once acquisition produced four polarized composition termed as HH, HV, VH, and VV. The co- and cross-polarization were used to simplify explanation for HH-VV and HV-VH, respectively. Following Saepuloh et al. (2015), we quantified the backscattering intensity by taking the logarithmic scale of the multi-look data. The range of backscattering intensity values in dB unit for co-polarization is wider than cross-polarization images. For co-polarization mode, the backscattering intensity is about -1 to 7 dB and cross polarization mode is about 0 to 6 dB. More features with low backscattering intensity were detected by cross- than co-polarization mode. Various physical properties and/or geometry of surface materials are predicted responsible to detected features. Measurement direction of surface roughness, radar geometry, and polarization mode are the main issue to be discussed in this section on how the surface roughness at field responses to the radar backscattering in range and azimuth direction. Figure 4: North-south roughness measurements in cross-polarization modes showing higher correlation than the other measurement direction and co-polarization mode (A) and scatterplot of roughness model derived from field roughness measurement showing the highest correlation using HV and VH simultaneously. where is surface roughness model based on polarized mode, is polarized mode either in H and V, is backscattering coefficient on polarized mode, and θi is local incidence angle. where h0(HV,VH) is surface roughness model using HV and VH polarized mode, h0(HV) and h0(VH) are surface roughness function based on eq. 3 for and , respectively. The spatial surface roughness model was calculated using a Triangulated Irregular Network (TIN) gridding method as depicted by Figure 5 (2nd row). We identified and simplified explanation for the rough, medium, and smooth surfaces with RMS height more than 10, about 8, and less than 8 cm, respectively. The RMS height of surface roughness between the model and field data agreed in general. According to the field data, the gradational surface roughness from rough to smooth surface is located at south to northwest part. The subset images of pH measurement and surface roughness model at the three geothermal surface manifestation zones is depicted by Figure 5. For Zone-1, the spatial distribution of low pH agreed to the rough surface roughness. The high resistance of the rock fragments than rock matrices to the hydrothermal fluid caused the ground surface is composed chiefly by material in gravel and boulder size. The volcanic products from lava and pyroclastics were responsible the roughness of altered surfaces. For Zone-2, the smooth surfaces are located at northeast part and agreed with low and medium pH as presented by point from WW25 to WW29. The hydrothermal interaction with tuff and laharic breccia caused the surface of mud pool zones is flat. The very smooth surfaces distributed sparsely at NW and SE are predicted from strong weathering process. For Zone-3, the smooth surfaces are located at southeast and west, respectively. The hot springs are located at very smooth surface as presented by low pH at WW60, WW61, and WW71. The interaction between hydrothermal fluids and fine to coarse old volcanic products at Zone-3 is responsible to the flattering of the surfaces. Moreover, the intensive weathering process might be also caused the surface is flat. Therefore, the effect of alteration and weathering are presented by very smooth surfaces at hot springs zones. 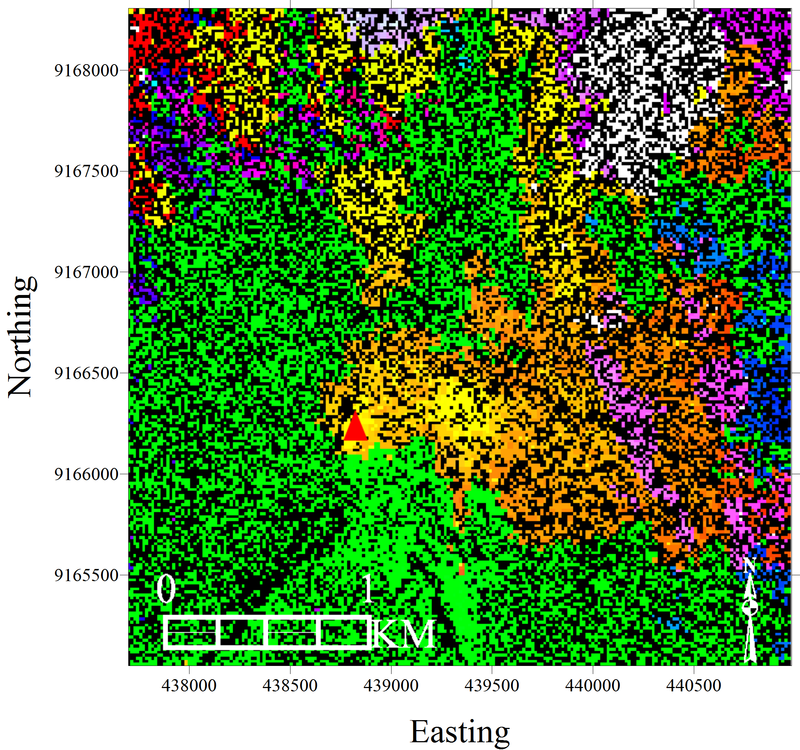 Figure 5: Spatial distribution of pH and surface roughness model obtained from cross-polarization modes for Zone-1 (altered surfaces), Zone-2 (mud pools), and Zone-3 (hot springs). Black dots area ground measurement points at the three zones. The physical properties of surface manifestation including acidity and surface roughness at geothermal field could be identified successfully. The acidity shown by lower pH than 7 at geothermal surface manifestations revealed a constant pattern in general that the lowest pH is located at and around surface manifestations. The separated plots between high and low pH were originated from thermal features in that the surface manifestation is local and the thermal effect from geothermal fluids affect the ground surface locally. Detrending and interleaving techniques were applicable for surface roughness measurements in cm scale. The techniques could quantify RMS height of surface roughness by emphasizing the small scale variation of terrain from general trend reducing topographic effect from roughness component within the profile. For the surface roughness, the geothermal surface manifestations were classified into altered surfaces, mud pools, and hot springs. The highest correlation between surface roughness and acidity was provided at the altered surfaces with volcanic products such as lava and pyroclastics, and mud pools with tuff and lahars. The discrepancy was shown by hot springs surfaces with laharic deposits containing fine to coarse old volcanic products. The rock types and thermal activities were significant to the surface roughness condition. The surface roughness model could be estimated based on Polarimetric Synthetic Aperture Radar (PolSAR) data from the Phased Array Synthetic Aperture Radar (PALSAR) onboard Advanced Land Observing Satellite (ALOS). The N-S field roughness measurements at altered surfaces provided the best correlation with the backscattering of cross-polarization, HV and VH modes. The azimuth or flight direction of the ascending satellite was influenced to the detected roughness in the cross-polarization mode. According to the field data and model, the low pH coincided to the rough surfaces at altered surfaces and the smooth surfaces at mud pools. The authors wish to thank Beneficial and Advanced Geothermal Use System (BAGUS) project in the Science and Technology Research Partnership for Sustainable Development (SATREPS) for supporting this cooperative research. This research is also supported fully by LPPM-ITB. Alzwar, M., Akbar, N., and Bachri, S.: Geological map of the Garut and Pameungpeuk Quadrangle, Jawa scale 1:100,000, Geological Research and Development Centre Indonesia, (1992). Campbel, B.A. and Shepard, M.K. : Lava flow surface roughness and depolarized radar scattering, Journal of Geophysics Research, 101 (E8), (1996), 18,941 – 18,951. Campbel, B.A. and Garvin, J.B.: Lava Flow Topographic Measurements for Radar Data Interpretation, Geophysical Research Letter, 20 (9), (1993), 831-834. Duarte, R.M., Wozniak, E., Recondo, C., Cabo, C., Marqunez, J., and Fernndez, S.: Estimation of surface roughness and stone cover in burnt soils using SAR images, Catena, 74, (2008), 264272. Evans, D.L., Farr, T.G., and van Zyl, J. J.: Estimates of surface roughness derived from Synthetic Aperture Radar (SAR) data, IEEE Transaction Geoscience Remote Sensing, 30(2), (1992), 370381. Farr, T.G. : Microtopographic evolution of lava flows at Cima volcanic field, Mojave Desert, California. Journal of Geophysical Research, 97(B11), (1992), 15171 15179. Farr, T.G., Rosen, P.A., Caro, E., Crippen, R., Duren, R., Hensley, S., Kobrick, M., Paller, M., Rodriguez, E., Roth, L., Seal, D., Shaffer, S., Shimada, J., Umland, J., Werner, M., Oskin, M., Burbank, D., and Alsdorf, D.: The Shuttle Radar Topography Mission, Reviews of Geophysics, 45, (2007). Gaddis, L.R.P, Mouginis-Mark, P.J., and Hayashi, J.N. : Lava flow surface textures – SIR-B radar image texture, field observations, and terrain measurements, Photogrammetric Engineering and Remote Sensing, 56, (1990), 211224. Gherardi, F., Panichia, C., and Yock A., Gerardo-Abaya, J.: Geochemistry of the surface and deep fluids of the Miravalles volcano geothermal system (Costa Rica), Geothermics, 31, (2002), 91128. Joseph, E.P., Fournier, N., Lindsay, J.M., Robertson, R., and Beckles, D.M. : Chemical and isotopic characteristics of geothermal fluids from Sulphur Springs, Saint Lucia, Journal of Volcanology and Geothermal Research, 254, (2013), 2336. Libbey, R.B. and Williams-Jones, A.E. : Relating sulfide mineral zonation and trace element chemistry to subsurface processes in the Reykjanes geothermal system, Iceland, Journal of Volcanology and Geothermal Research, 310, (2016), 225241. 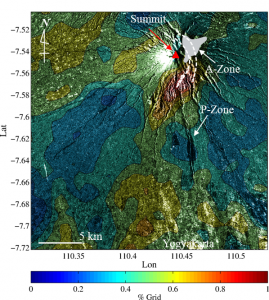 Saepuloh, A., Koike, K., Omura, M., Iguchi, M., and Setiawan, A.: SAR- and gravity change-based characterization of the distribution pattern of pyroclastic flow deposits at Mt. Merapi during the past ten years, Bulletin of Volcanology, 72(2), (2010), 221-232. Saepuloh, A., Koike, K., and Omura, M.: Applying Bayesian decision classification to Pi-SAR polarimetric data for detailed extraction of the geomorphologic and structural features of an active volcano, Geoscience and Remote Sensing Letters (GRSL), 99(4), (2012), 554-558. Saepuloh, A., Koike, K., Urai, M., and Sri Sumantyo, J.T. 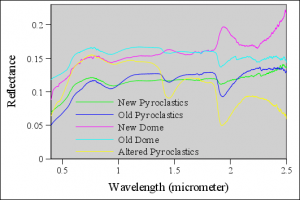 : Identifying surface materials on an active volcano by deriving dielectric permittivity from polarimetric SAR data, IEEE Geoscience and Remote Sensing Letters (GRSL), 12(8), (2015), 1620-1624. Shimada, M., Isoguchi, O., Tadono, T., Higuchi, R., and Isono, K.: PALSAR CALVAL Summary (JAXA-PI193), Proceedings. The First Joint PI Symposium of ALOS Data Nodes for ALOS Science Program, Kyoto, Japan (2007). Whittaker, J.M., Muller, R.D., Sdrolias, M., Heine, C.: Sunda-Java trench kinematics, slab window formation and overriding plate deformation since the Cretaceous, Earth and Planetary Science Letter, 225, (2007), 445457. Keywords: SAR, Surface Manifestation, Geothermal, Backscattering, Remote Sensing. The optical remote sensing sensors were facing problem to identify ground surface under Torrid Zone for last decades. The cloud and thick vegetation canopy always becomes an obstacle for remotely sensed sensor to reveal surface geology features. Therefore, the advantage of satellite data for geology exploration as well as hazard mitigation is less effective. Nowadays, remote sensing technology is approaching a new era, especially in the use of microwave sensors onboard space borne termed as Synthetic Aperture Radar (SAR). The SAR is an active remote sensing technology which operates regardless time and weather condition. The application of SAR sensor for geology and geothermal related study is growing rapidly. However, the use of backscattering intensity of SAR data for geothermal prospection is still limited. The main problem might be originated from the geometric distortion and/or limitation of waveband. Overcoming the problem, we present our achievements in the use of backscattering intensity of SAR data for detecting surface manifestation precisely. 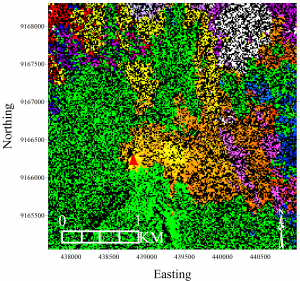 An automatic extraction of linear feature density from Synthetic Aperture Radar (lifedSAR) is demonstrated to estimate the fluid path related to faults and fractures at Mt. Tangkuban Parahu, West Java, Indonesia. In addition, a Polarimetric SAR data was used to detect the distribution of surface manifestation based on surface roughness criterion. Combining both methods is superior to minimize the detection errors from environment noises. Following this approach, we could correlate the surface manifestation with Linear Features Density (LFD) and surface roughness. The alteration zones are located at medium to high LFD values and low to medium surface roughness, respectively. The Fluid Path Index (FPI) and field investigation confirmed the location of alteration zones in the SAR backscattering image. Therefore, detection accuracy using remotely sensed data under Torrid Zone could be improved as presented in this study. 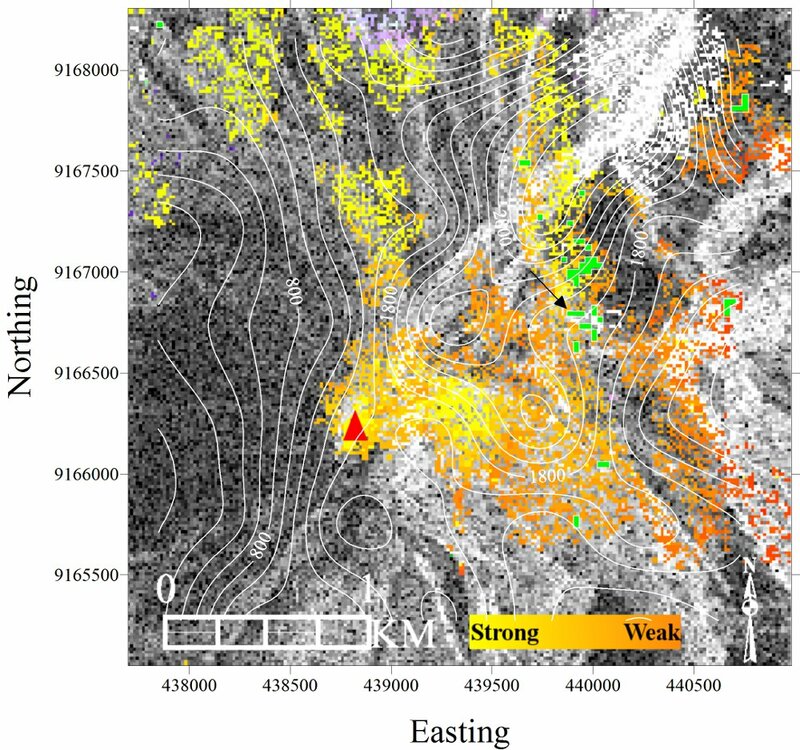 Surface geology identification under Torrid Zone using conventional optical remote sensing encountered some problem due to the atmospheric and surface conditions such as clouds, intensive weathering, and canopy vegetation. Overcoming the problem, we exploited the Synthetic Aperture Radar (SAR) to characterize geological structures within a geological formation. 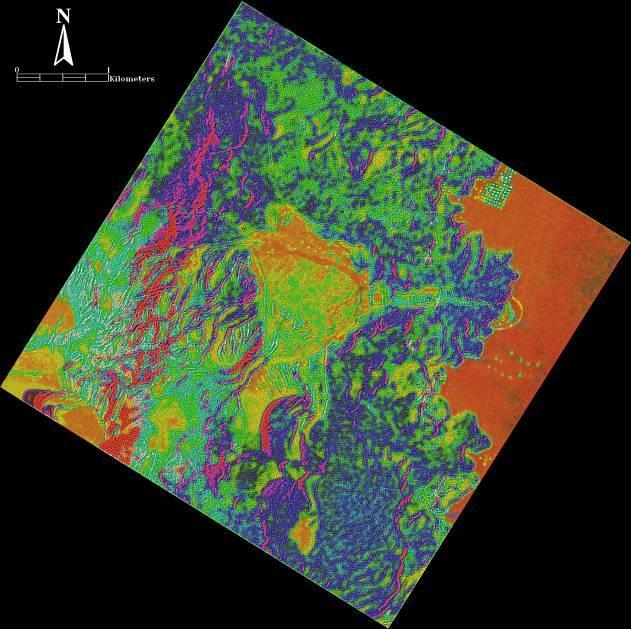 The cross-polarized data of the Phased Array type L-band Synthetic Aperture Radar (PALSAR) onboard the Advanced Land Observing Satellite (ALOS)　was fused using an optical sensor data. A reverse fusion technique was proposed to characterize ground surface. The characterization process is focused to the influence of backscattering intensity derived from cross-polarized SAR data. The Rajamandala Carbonate Complex (RCC) in West Java was selected as study area. The histogram of cross-polarized backscattering intensity is distributed normally with standard deviation about 4.5 dB. According to the reverse fusion result, we could characterize the RCC into four zones. The low and high bacscattering intensities are related to density of geological structures. This study can be used to characterize detail surface geology, even though within single rock formation. The Synthetic Aperture Radar (SAR) is an active remote sensing technology which operates regardless time and weather condition. The application of SAR technology for geology and geothermal related study is growing rapidly. The successful studies in the Interferometric SAR (InSAR) for recognizing ground surface deformations at geothermal power plant were proved that this technology could contribute significantly to geothermal study. Moreover, detecting structural features at ground surface are also important as a key to predict the fluid paths of a geothermal system. 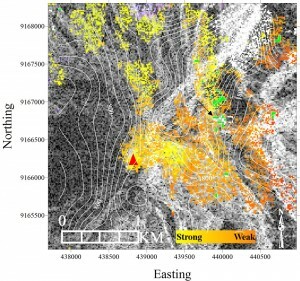 However, the use of backscattering intensity of SAR data for detecting structural features at surface is still limited. The main problem might be originated from the SAR geometric distortion and/or limitation of waveband. Overcoming the problem, we used dual SAR observation modes and applied a technique termed as an automatic extraction of linear feature density from SAR (lifedSAR) to detect and quantify structural features at surface. This technique is aimed to predict to fluid paths of geothermal system around active volcanoes. The left and right looking directions of the SAR sensor provide broad view of the local structural features. In this study, we detected the high structural features which are presented by Linear Feature Density (LFD) agree with the location of surface manifestation of a geothermal system. Therefore, the LFD could be potential parameter to predict the fluid path of a geothermal system. 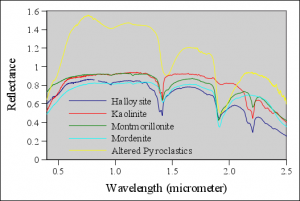 The field geological investigation and data fusion between SAR and hyperspectral data were used to validate lifedSAR result. Figure 1. Backscattering intensity images of ALOS PALSAR in Ascending (A) and Descending (B) orbits show the surface characteristics of Mt. Merapi in different looking direction. Figure 2. The total LFD calculated using LifedSAR overlaid on intensity image show the alteration zone (A-Zone) is located in the high LFD values. Field mapping activity for an active volcano mainly in the Torrid Zone is usually hampered by several problems such as steep terrain and bad atmosphere conditions. In this paper we present a simple solution for such problem by analyzing Synthetic Aperture Radar (SAR) and optical sensor image data. By a combination of two types of satellite images, we detected the geothermal paths by identifying the alteration zone termed A-zone. The main purpose of this study is to discriminate alteration of the pyroclastic flow deposits and estimate their alteration degree by selecting Mt. Merapi in central Java, Indonesia, as a study site and targeting the eruptions during May-June 2006. To delineate the A-zone, we applied an image fusion technique using a ratio image of RADARSAT-1 SAR β0 data and an MNF transformation of Hyperion image data. The acquisition dates of these images were almost the same to reduce large different change in the image characteristics. In addition, a field survey was carried out to check the usefulness of the image fusion results. The A-zone is found to extend in the eastern flanks by 1.5 km2 which are covered mainly by the old pyroclastic flow deposits. This area can be interpreted as an ascent flow zone of hydrothermal fluids beneath the summit. Figure 1: Mt. 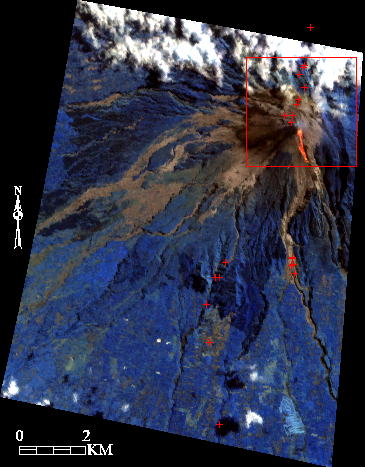 Merapi on a RGB color composition of a Hyperion image using three bands, 2.19 μm (R), 1.65 μm (G), and 1.07 μm (B). Red rectangular and red “+” stand for the main target area and rock sample locations, respectively. Figure 2: Field photograph of altered rocks in the eastern part from the summit. 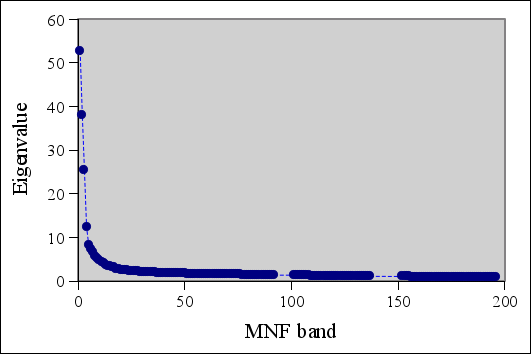 Figure 3: Eigenvalues of Minimum Noise Fraction (MNF) bands selected for image fusion. 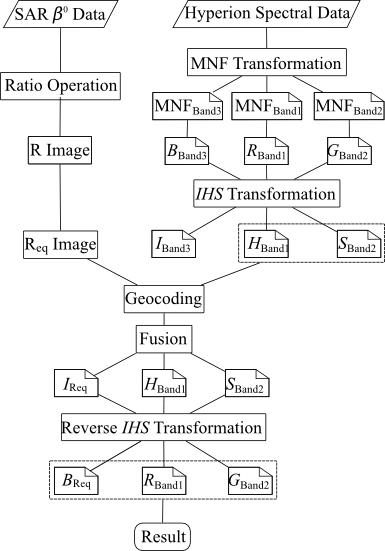 Figure 4: Work flows of image fusion for RADARSAT-1 SAR and Hyperion image data. Figure 5: Color composition of image fusion result by R: Hue (MNF band 1), G: Saturation (MNF band 2), and B: Intensity (RO equalized value). The A-zone is located in yellow-orange portions in the eastern part from the crater (red triangle). 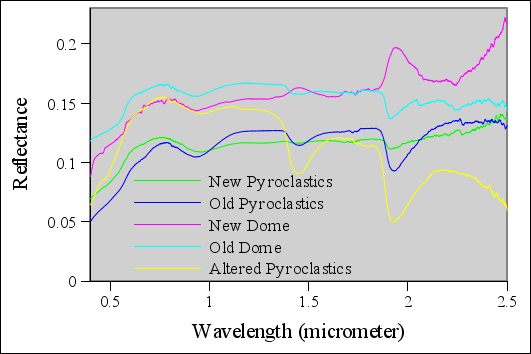 Figure 6: Reflectance spectra of rock samples from visible to short-wave infrared regions. 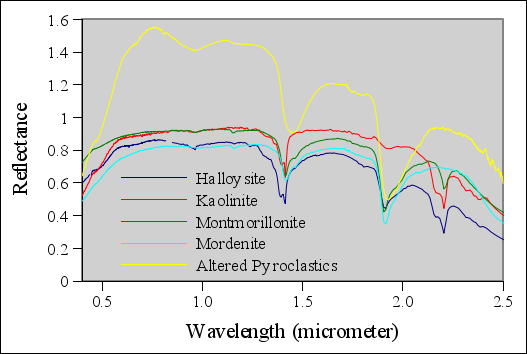 Figure 7: Reflectance spectra of the AP compared with the reference spectra of clay minerals and silicates in the USGS spectral library. Figure 8: Distribution of the A-zone overlaid with contour lines of lineament density from directional filtering of the SAR ß0 image on July 4, 2006. The black arrow and green polygon stand for the sample location of the AP and the alteration rocks inferred from SAM classification. Saepuloh A., Koike K., Discriminating alteration of pyroclastic flow deposits in an active volcano by SAR image analysis for assessing the geothermal system, Proceeding of the World Geothermal Congress 2010 (WGC 2010), in PDF format No. 1336, pp. 1-5, Denpasar-Bali, Indonesia, April 2010. 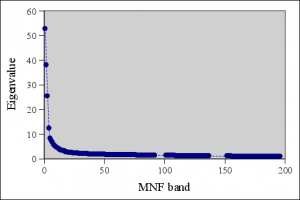 As a microwave remote sensing, an airborne high-resolution multiparameter synthetic aperture radar (Pi-SAR) has two types of frequencies, L-band and X-band. In this paper, the authors used L-band frequencies of Pi-SAR data due to the wavelength which has possibility to penetrate vegetations. The aim of this study is to demonstrate the effectiveness of Pi-SAR data in analyzing volcanic surface condition. Some image processing methods were used to extract surface terrain features such as unsupervised classification and false color composition. The results were compared with an optical sensor image such as Landsat ETM+ for the same area. Mt. Sakurajima, a typical active volcano in southwest Japan, was chosen as a study site due to its high activity. The results showed that the Pi-SAR data could generate geomorphologic units such as volcanic cone, volcanic-terrace, and volcanic foot which were validated by the polarimetric signatures. On the other hand, lava flows structure appears clear and easy to be distinguished from the other products such as debris pumice or pyroclastic deposits. However, geomorphologic features and lava flows structure could not be detected by the optical remote sensing. Consequently, the Pi-SAR polarimetric data was proved had to have high capability to detect roughness of the volcanic terrain rather than optical remote sensing. Saepuloh A., Koike K., Omura M., Iguchi M., The application of Pi-SAR polarimetric data to detect surface condition of an active volcano, Proceeding of the 9th International Symposium on Mineral Exploration (ISME09), Bandung, Indonesia, pp. 236-240, September 2006.